Circle of Blue’s senior editor Keith Schneider reflects on — and celebrates — this year’s body of work from our top reporters. 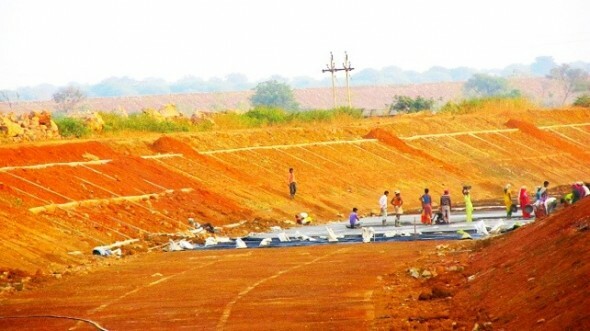 Pressed by growing demand to cool a proliferation of new coal-fired power plants in Chhattisgarh, India, workers expand and modernize a big water transport canal. TRAVERSE CITY, Michigan — As we’ve known for years now, the diminishment of the mainstream American media is opening fresh opportunities for more nimble and skilled newsrooms to produce first-rate reporting. Nowhere is that more true than at Circle of Blue where I serve as senior editor, reporting from overseas and across the United States and helping to guide an extraordinarily talented and committed stable of young journalists, producers, and graphic artists. My colleague, Circle of Blue’s newsdesk editor Aubrey Ann Parker, collected all of our online work from 2012. Take a look at the links below. They describe a remarkable story of a 21st-century online multimedia newsroom of the future — based in Traverse City and collaborating with prominent think tanks, universities, media partners, and government agencies around the world. In the realm of global journalism — from the front lines of the confrontation over rising demand for energy and food and diminishing supplies of fresh water — no news and science organization is producing a stronger, more learned, more probing report. Last summer, Circle of Blue won the $US 100,000 Rockefeller Foundation Centennial Innovation Award for our distinctive and collaborative international operating system, which produced Circle of Blue’s influential Choke Point: U.S. and Choke Point: China reports. As a journalist who has reported from four continents on energy, land use, environment, and policy since the late 1970s, the Circle of Blue assignment is rich in every way. I commend and celebrate my colleagues — co-founders J. Carl and Eileen Ganter; correspondents Nadya Ivanova, Brett Walton, Codi Yeager-Kozacek, and Andrew Maddocks; newsdesk editor Aubrey Ann Parker; Web producer Jordan Bates; the Wilson Center’s China Environment Forum director Jennifer Turner; photographer Aaron Jaffe; special contributor Jacob Wheeler; and the crew of accomplished interns who spend time with us each year. I’d love to hear from you: what were your favorite 2012 waternews stories that we covered? What would you like to see Circle of Blue report on in the future? Contact Keith Schneider, send a Tweet to @modeshift, or comment below. This post was originally published at Mode Shift, Keith Schneider’s personal blog.